There have been a lot of complaints and bug reports about the state of the $ MathJax $ editing experience all around SE lately. We've heard you, and with a lot of help from the kind folks from $ MathJax $ (a special shout out goes to Davide), things are finally moving along. 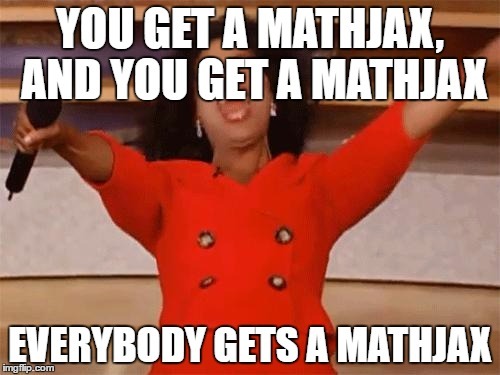 Today we're rolling out a beta version of the $ MathJax $, PageDown and Markdown integration on meta.math.SE and math.SE, that addresses a bunch of issues. We chose math.SE, because it already proved to be helpful with $ MathJax $ issues in the past (it is the only site that runs on the latest beta.mathjax.org bits). So please be extra mindful of any $ MathJax $ issues you may encounter in the following days, and please report any bugs here on meta.math.SE. For offline editing on OS X, for math.SE, I am using MacDown from http://macdown.uranusjr.com/. I find this extremely useful. I can grab an in-process answer on math.SE, continue with MacDown offline, and copy and paste it back on math.SE when done. I have not had a problem yet.